Scheduling Your Moving Truck-How Much Notice Do You Need? Unless you're moving a very short distance and can do many hops in your own car or pickup - or if you're moving with a group of people (such as in the Military), or your family has access to a suitable truck, its important to schedule your moving company as far in advance as possible, to allow you to ensure that you get your truck on time and in the right place. You can collect quotes online based on your moving date and expected destination - and then get on the phone and confirm and discuss the quotes if necessary. During this phone call, you can also ask about anything you've got concerns about, if you have special pieces or concern about the move. You may need some basic information on the amount of items you want to move, the sizes of your bulky items, and whether you'll be moving into a house that's up stairs or an elevator - and what access you have, as some companies charge premiums for this if you're using their team to move. Access includes whether its a long way to your front door, or if parking is readily available, or conversely, difficult. Scheduling a moving van can be pretty straight forward - once you work out how large a moving truck you need. An average four bedroom house requires around a ten ton moving truck or a little more, but some families have fewer belongings, and some have more, so its important to judge carefully. Calling your moving company or the prospective moving company to find out as much as you can long before the big day is definitly in order. In addition, you will usually have to pay a deposit on your truck so you should take that, and your gasoline requirements into account - so that you can budget accordingly. These may or may not be included in your final price for rental, so you may need to look closely at each quote before deciding which one works for you. 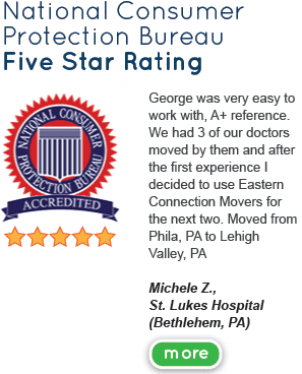 If you're interested in moving and need to find just the right moving company in Philadelphia, Eastern Connect Movers can help you to find the right balance between service and price.